Remembrance Round has come and gone with a flurry of poignant ceremonies and cracking football to mark the end of round 4, and in case there was any doubt, plenty to talk about. Well done to those in charge of the A-League in the running of a round of football that commemorated and showed heart-felt appreciation to those who gave their lives in battle. Domestic football played over summer is a curious beast in Australia, given that football is historically and generally a winter sport. While the oval ball codes of AFL, NRL and Super Rugby have a stranglehold on winter sport and, thus, the Anzac Day games, the A-League can make its own mark with the Remembrance Round where football falls on 11 November. On this particular round, to mark 100 years since the armistice to end the Great War, five matches played across the land were all marked with silence, the bugle played to thousands peacefully observing ceremonial remembrance, and football ultimately played in a spirit that did honour to the occasion. Whatever your thoughts are on war in general, it is hard to argue that where sport brings people together to mark that occasion by remembering those who gave their lives to allow us to enjoy so many daily activities that we might take for granted, it is the type of occasion allowing sport to serve a social purpose. 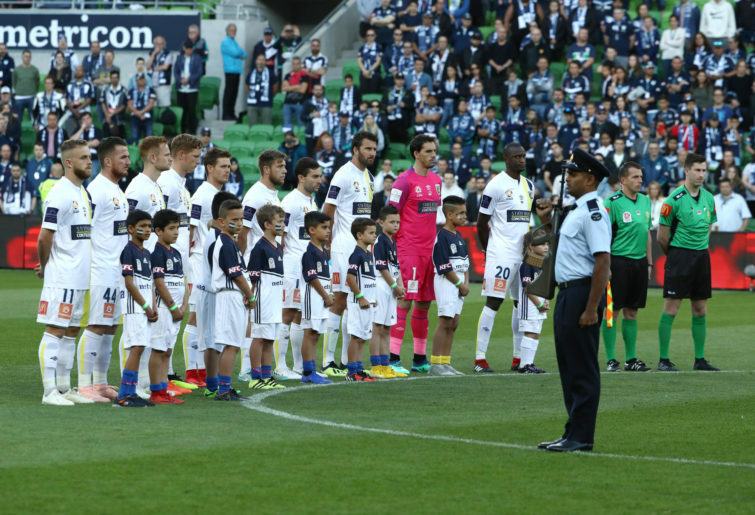 In fact, the true credit to the A-League is not in the mere remembrance, but in the fact that they found the balance between marking the occasion with dignity, rather than having it descend into distasteful commercialism. While there is no glorification which can be found in war that would have a place on the sporting field, the simplicity of silence spoke volumes this round. The sight and experience of thousands standing in quietness, all uniform in their appreciation of so many lives lost so that we can continue to embrace these moments, gave this round so much more significance than the players on the field, the spectators in the stands, and the viewers are home. And dare I say it, but where the headlines and sound bites so very easily gravitate towards the negative impact that football has through that wretched word “hooligans,” it was, in fact, heartening and uplifting to see our game bring its people together. The commemorative nature of the round went beyond these shores. As Keisuke Honda opened the scoring for Melbourne Victory, he ran to the crowd in celebration. However, more than merely celebrating the goal, Honda was kissing the poppy adorning his jersey, and pointing to the sky. What his actions meant, ultimately, only Honda can say. But a Melbourne-based Japanese player, in Australia, kissing a poppy in commemoration of those who died at war on the 100-year anniversary of the end of the Great War? If nothing else, that will leave a lasting memory. Congratulations A-League, and football more generally. On this occasion, you did your country proud. There is an episode of Seinfeld where George Costanza decides that he is going to start living his life differently, making decisions where he always goes against his instinct. In doing so, his life starts to turn around, become positive, and everything turns out a winner for him. However, at the same time, Elaine starts to meet all sorts of disaster in her life, where nothing goes right, and everything instead starts to unravel for her. Jerry meanwhile, merely observes, as not only does his life stay pretty much the same, but he says that everything for him breaks even, so where one friend is up, another must thus come down. There was a bit of the equilibrium Jerry about the Melbourne City against Wellington Phoenix game on Friday. In this scenario, the A-League is Jerry, Melbourne City is George, and poor Wellington ends up being Elaine. 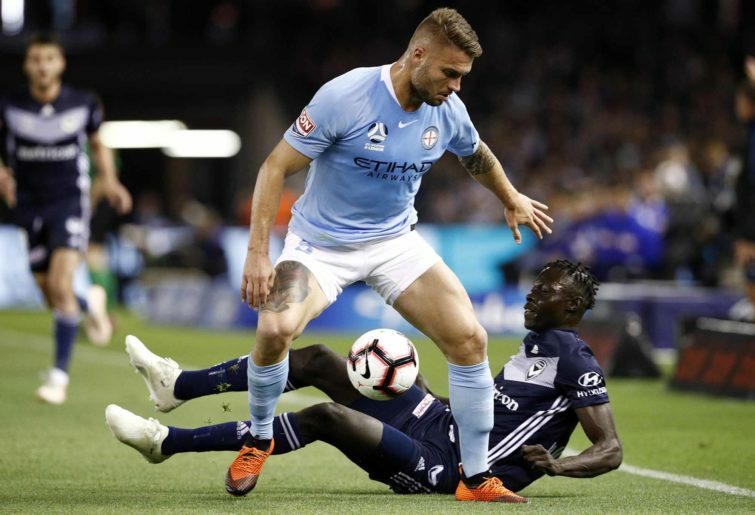 A week ago, Melbourne were down, having been easily disposed of by Sydney FC, and in need of a drastic change in direction. Wellington, also coming off a hard loss to Western Sydney, were not going so bad, their confidence up, and seeming to be doing well. Come this round? Melbourne have turned the tables, delivering Wellington their own reality check, and sending Wellington into a losing streak, while City put their season back on track. Bruno Fornaroli was on the scoresheet, the likes of Roy Krishna could not get on the scoresheet. Where one goes up, another must come down. Unfortunately for Wellington though, the equilibrium appears to be sending Wellington back to the negative territory of the last couple of seasons they were so desperately trying to drag themselves out of. As for City, they will be hoping that much like George Costanza, the chickens don’t all eventually come home to roost. If the A-League got the Remembrance Round spot-on, then Western Sydney holding their home match at Mudgee during the round was the cherry on top. If you are currently nomadic, i.e. without a home ground while it is being re-built, then taking the game to the country is pure and absolute genius. The A-League, after all, is a relatively small competition, when you consider they are 10 teams in a country the size of Australia. The crowd appeared solid enough, and the game was watchable. There was a shameful episode where Jamie Young was overheard arguing with a patron in the crowd over allegations of racist abuse, and the league must act on that swiftly. But that instance aside, taking the game inland has merit. If there are more opportunities for A-League teams to take their games out to the people (I know Newcastle have played in Port Macquarie before), then why not? Spread the game where you can, and towns like Mudgee will be hugely appreciative of it. During the Brazil World Cup, I had the privilege to sit behind the goal as Tim Cahill scored what, I thought, was the goal of that tournament against the Netherlands. I was reminded of that statement as Nick Cowburn and Dimi Petratos came charging toward me at McDonald Jones Stadium as they rescued a point for the Jets with an 86th-minute equalizer. As the crowd got to their feet, and the Jets players charged towards us in the south-western corner of the grandstand, the celebration of that one goal went into over-drive, and it will be one of the highlights of my year. From when the referee blew his whistle, to Nick Cowburn heading true, it took three seconds. Three seconds to turn 85 minutes of mind-numbing, soul-destroying and agonizing football, to become one of the great nights in Newcastle Jets history. Last week, I opined that scoring for Newcastle ain’t easy. When I think about it, in football, scoring, in general, is not easy. It was not meant to be. While the AFL grapple with trying to find ways to increase goals from the on average 20 to 30 goals they already have, and rugby league is trying to speed up play for more tries, where they again generally get roughly 5 to 10 tries, football continues with its tradition of one-nil, two-nil, two-one scorelines, and the dreaded nil-all endeavours. As Nick Cowburn will attest to, it’s the rarity and importance of goals that make the game so great, and those moments (or three little seconds) that can change not only the course of a game, but a season. Now a player that is way too easily taken for granted in this league is the Perth Glory captain. The Scunthorpe United and Wolverhampton player, with various stints around England, who has played for his country on 30 occasions, is now something of a veteran of the A-League, entering his third season for the Glory. The journeyman often got lost in the anger of Kenny Lowe during the last two seasons, and I can’t help wonder if a more disciplined thinker in Tony Popovic is just what the Irish front man craves in a coach. In his 67 games for Perth, Keogh has managed 28 goals, which is a quite exceptional return in a team that over the last few seasons has struggled. Andy has scored in four straight matches, and is captaining a team already top of the table, and as I pointed out last week, if you’re top 2 early on, you’re likely going to be top two come season’s end. But what caught my attention the most about Keogh against Adelaide? 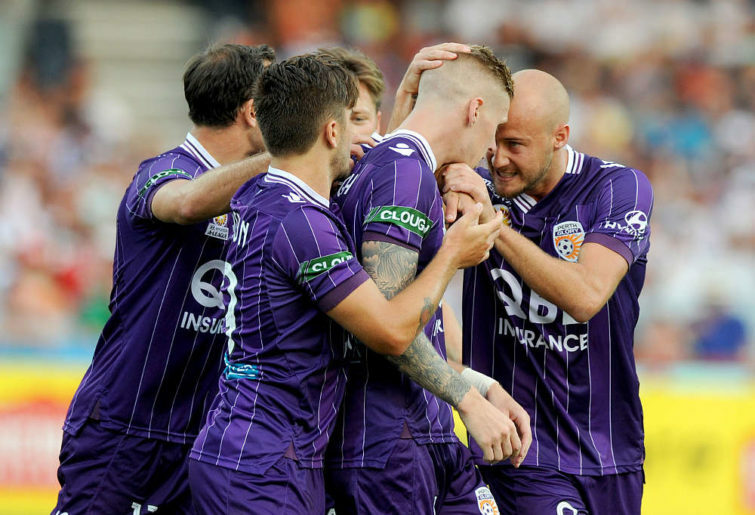 As his side held onto their one-goal lead, and Perth were battening down the hatches for the inevitable Reds onslaught to try and get an equalizer, there was Andy Keogh, defending in his own defensive corner, leading his team from the front at the back. Andy Keogh at the moment is playing like a captain that can take his team to a championship. He’s scoring goals, he’s helping out in defence, and his team is on the top. Like I said, a player too readily taken for granted. Those three first-half goals from Melbourne Victory were ominous. Granted, Keisuke Honda’s opener was a gift from Golec, but the Japanese playmaker still had to finish off with the type of poise and composure that Melbourne are paying good money for. Troisi’s goal was a delightful finish, a timely reminder to the new Socceroos coach that his talents are still available for national selection. And the final goal by Corey Brown was as much about the defender’s sheer perseverance as it was the all-round team’s pressure on the wilting Central Coast opposition. Melbourne looked like a team on a mission, with one or two points to prove, and if they are able to mount a strong run in this season’s finals, they can thank the eastern NSW shores for the kick-start to their season, both in a gruelling one-nil win over a profligate Newcastle, and a destructive follow up against a sub-par Central Coast outfit. In that first half, Melbourne looked like the complete package of champions they were built to be. And then they brought on Ola Toivonen. Four rounds in, two wins, two losses. This Melbourne team has set itself up very nicely.